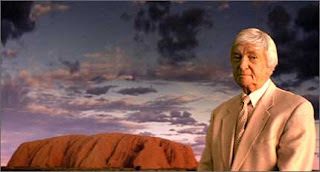 Richie Benaud in a scene from the new tourism ads. Australia needed to work harder to alert tourists to its virtues because "we're the last stop on the bus route", the federal Minister for Small Business and Tourism, Joe Hockey, said at yesterday's launch of the nation's biggest ever push for visitors. "We can't be just another theme park, we can't be another hotel room," he said. "We must provide visitors with a life-long experience." Spearheading the $360 million campaign are six, one-minute ads that feature Australian celebrities - among them Delta Goodrem and Richie Benaud - recasting Australia in a different light. They will be shown both nationally and internationally in cinemas and on TV, with the first to be aired this month in Singapore, Italy, Britain and Australia. Mr Hockey hoped the ads would entice new visitors who would become "life-time ambassadors" for Australia. A total of $120 million has been earmarked for the campaign's international marketing, which tops up the Australian Tourist Commission's annual budget of $90 million. The inbound and domestic tourism industry contributes $70 billion to the economy and employs 500,000. [And the Australian ruling class will lock up and frame-up, for 'life', anyone for a crime against any 'backpacker or holiday maker from overseas' no matter whether they were 'guilty or not' and no matter whether they 'found any dead bodies' or whether they found any 'weapon that killed a tourist' and even if there is only 'flawed circumstantial evidence' and 'trial by media' to prove their case. Chris Brown, the chief executive of the tourism industry lobby group, TTF, said he expected the industry, which had been urging the Government to increase funding for marketing, would now put more money into promotion. He described the ads as "sensational". The theme of the campaign is "Australia: a different light", and is focused on emphasising the qualities that distinguish Australia from other destinations and encouraging broader perceptions of the country. Gone are the images of barbecues and beaches, that typified previous campaigns, and in their place are snapshots of Australia's landscapes at their most stunning. Even the Opera House and the Harbour Bridge have been given supporting roles. The Government hopes the images will resonate with those tourists in search of a richer experience. The ATC's marketing chief, Stephen O'Neill, said: "We wanted to show a different side to Australia, not just the sun, the sea and the sand but the history and the culture of the place. "Today's tourist is looking to learn more about the country rather than just enjoy some of its more obvious delights." The domestic campaign will feature the slogan "See Australia in a different light". The commercials cost $3 million to make and were shot over an 18-day period and took in every state and territory. They are Australia's response to the "100% Pure New Zealand" marketing campaign which has successfully branded New Zealand as the southern hemisphere's nature destination, lifting visitor numbers by 33 per cent in four years. Organisations such as Fosters, RM Williams, Penfolds and the Australian Council for the Arts were consulted on their perceptions of Australia, the results of which formed the bedrock of the strategy behind the commercials. Among the other identities to feature in the commercials are poet Les Murray, Aboriginal artist Barbara Weir, comedian Jonathan "Jono" Coleman and British TV presenter Michael Parkinson. The lawyer of the man accused of murdering British backpacker Peter Falconio has spoken to the media in Darwin. Adelaide Barrister Grant Algie is urging the media to respect the judicial process and allow 45-year-old Bradley John Murdoch the right to a fair committal hearing.